Spielgaben 7 is made up of seven differently-shaped tablets. You’ll find colourful squares, equilateral triangles, right angle isosceles triangles, scalene triangles, obtuse isosceles triangles, circles, and half circles. While the building Spielgaben help children understand concepts of division, Spielgaben 7 teaches concepts of combination. In addition, the shapes and colors of Spielgaben 7 encourage children to create more realistic, representative objects and build basic drawing skills. A child learns naturally, for example, that a house can be made out of a square and a triangle. Extended play with Spielgaben 7 allows children to identify shapes in nature and teaches them to combine those shapes in their own work. Do you know the difference between an equilateral, isosceles, and scalene triangle? If you don’t, it is probably because you memorized these terms in high school instead of learning about them through exploration as a young child. While playing with Spielgaben 7, your child will discover that all plane geometric figures can be made from triangles. Your child will learn problem solving and special rotation skills as well as relationship between 3D solids into 2D flat figures. With these shaped-tablets children can begin to take apart images in their mind and recreate them more abstractly using the shaped tablets. For example, a cat’s head becomes a circle with two triangles or a tree becomes a group of circles with a few squares for a trunk. The way kids represent objects and create pictures becomes much more complex as they begin to incorporate these shaped tablets to bring their ideas to life. The abstract thinking will pave the way for more logical thinking and problem-solving skills. The patterns children create will also become more intricate, incorporating many different shapes and angles, as well as colors. 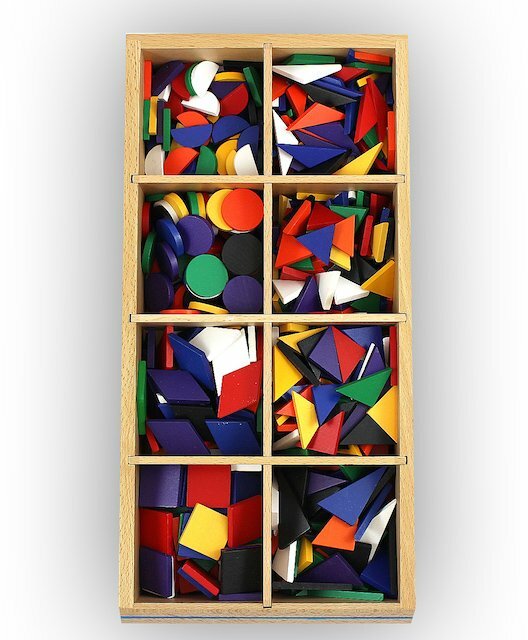 These will help children not only learn about mathematical forms, but also about beauty. Many of the patterns they create will have more to do with making something that looks nice rather than making something that shows mathematical concept. If a part of their pattern is off, kids will recognize it by the different color or different angle that makes the pattern “ugly” and disconnected in their eyes. Other children may find beauty in the disconnected pattern and experiment with adding flaws to create unique images and combinations.